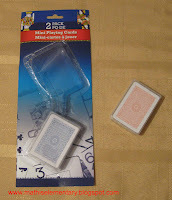 Have you seen these mini playing cards at the dollar store? I loved them so much when I found them that I made a set of math mats to use with them. Click the picture to go to my blog and get a set for yourself.